These high-tech home security cameras will keep a watchful eye on your property. D-Link is one of the more recognizable names in the wireless technology market. So it’s logical that they would make a Wi-Fi security camera that would be relatively low in price and still have an excellent set of features. However, it’s not as easy as to set up as their Wi-Fi routers are. Their DCS 2630L Wi-Fi security camera has a wide angle field of view and a de-warping technology that reduces distortion of the image. Wireless AC (the top of the line in Wi-Fi right now), a Windows Mobile app, full HD video, and night vision out to 16 feet from the camera are some of the features that set this camera apart from others. The Arlo Pro records HD video indoors or out but that video suffers from what photographers call “fish eye” distortion at the edges of the recorded image. And the PIR (Programmed InfraRed) motion sensor covers almost as much area as the 130-degree wide-angle camera lens does. So movement in the covered area will be automatically recorded. This Wi-Fi security camera also has a piercing 100+dB siren with multiple triggers. Also, Arlo is from a major player in the wireless networking field, Netgear. Make sure you know the 50 places thieves will never look in your home as you set up a home security camera. 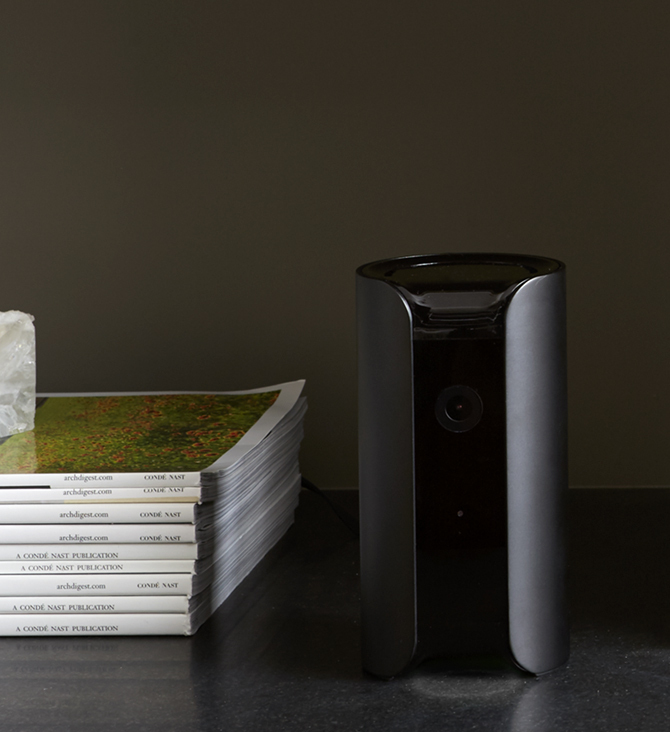 Canary calls their indoor Wi-Fi security camera an “all-in-one indoor security system.” Although the Canary Wi-Fi security camera is easy to set up and use, its wide-angle camera lens suffers from fish-eye distortion. But its design also allows you to set it out of the way on a shelf or table or add the mount and put it on a wall. Find out the 35 things burglars don’t want you to know. The Nest Wi-Fi security camera is one of the few cameras that looks this good and is this easy to use. And the mounting system it comes with allows it to be set on a flat surface, mounted on a wall, or mounted to a magnetic surface. You can even mount it to a standard camera tripod. The built-in microphone and speaker allow you to tell Fido to get off the furniture, or to remind your kids about the test for which they need to study. But Nest’s camera doesn’t offer a field of view that’s as wide as some other cameras. However, it also doesn’t suffer as much fish-eye distortion. Don’t make your house a target by knowing the 35 things you don’t know that make your house a target for burglars. If you’re looking for an outdoor Wi-Fi security camera, chances are you want one that is completely cordless. Hence the desire for Wi-Fi security camera instead of wired installation. The Oco Pro Dome has a great camera with a wide field of view and resolution both day and night. And, the Oco Pro Dome uses tamper-resistant screws and bolts to keep it safe from vandals and the housing is built to handle weather extremes from – 22° F up to 140° F. However, the Oco Pro Dome has one major drawback—it has to be mounted within 25 feet of a protected power outlet. Here are 21 things a burglar won’t tell you. Older outdoor security cameras had terrible video quality and even worse night video quality. Advanced features like IR cut filters and the ability to communicate with those in the picture? Forget it. The Uniden GC45S off that and the ability to transmit data up to 500 feet. The Nest Cam Outdoor is another example of the company’s desire to combine looks with functionality. This camera is also corded, because the company feels that battery-powered cameras can miss important visual cues before they turn on and start recording. And the camera’s lens captures 130 degrees of visual and doesn’t suffer from fish-eye like many other cameras do. Nest’s app allows you to create a live stream and password-protect it so it can be shared with your neighbors.But the problem is the power cord. Although the cord is sturdy, it still requires that the camera be installed within proximity to an electrical outlet. The garage is a frequent target for thieves to gain entry, here’s how to lock down your garage. 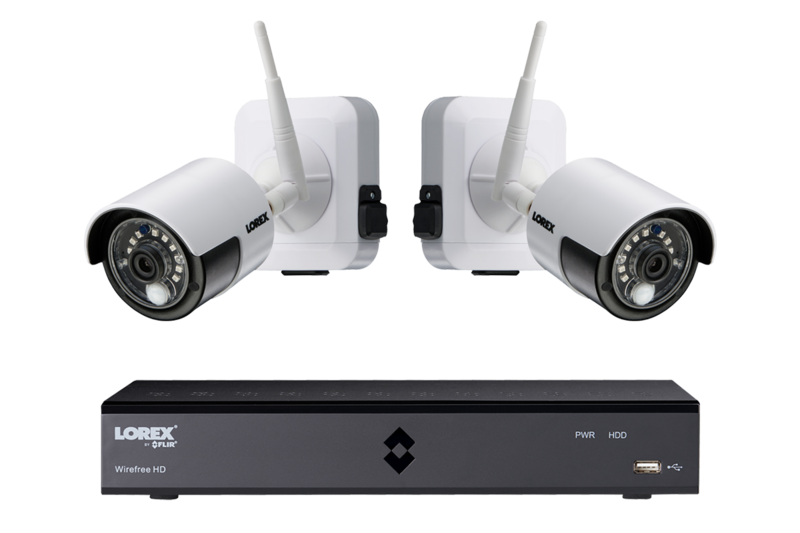 Lorex doesn’t sell just cameras they sell complete wireless video security solutions. These consist of a Lorex DVR and up to six cameras. The Lorex camera offers excellent video quality in both daylight and low light settings. And has a PIR that it uses to switch on and begin recording video. They are completely wire-free so they can be mounted anywhere after initial setup. The included battery is said to last for up to four months of regular usage. But, their major drawbacks are that they require the special Lorex DVR and it can’t automatically upload video to the web. However, there is an app that lets you stream video remotely if you have the DVR connected to your router. Beef up your home security with these three tips on how to reinforce your door. After a couple bikes were snatched out of my garage, I installed a pair of Blink security cameras for some peace of mind. The two cameras and a sync module cost about $170, and the only requirements were that the cameras are in range of my Wi-Fi. There are no monthly fees, and videos and photos are stored on your phone. Because the cameras are only active when there’s motion, battery life is pretty phenomenal (I’m still on the original batteries after six months ­the manufacturer says batteries should last about two years). Blink also makes exterior-rated cameras, and you can mix and match up to 10 interior and exterior cameras on the system. For now, though, I’m just keeping tabs on my new bike and tools. – Andrew Zoellner. Try these tips during winter to keep your home secure. This unique home security system is different from your average WiFi smart camera, thanks to its alarm that functions as a warning and a deterrent. It also offers free cloud storage and a battery backup of its own. The high-resolution 180-degree camera comes with night vision, motion and sound detection, temperature, light and humidity sensors, and a two-way audio and 105 dB siren. It’s also compatible with Z-Wave wireless accessories. Save money on a home security system by installing it yourself. Here’s how. 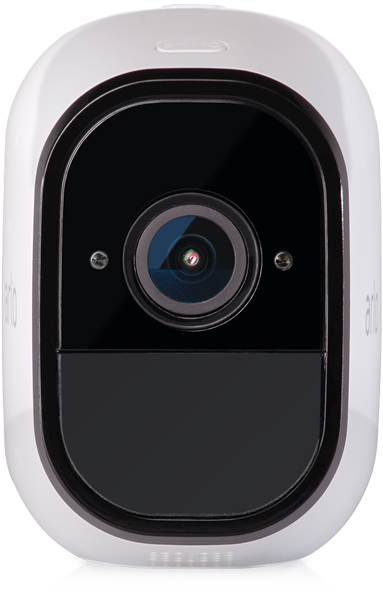 The Tend Insights Lynx Indoor security camera offers the unique ability to provide facial recognition. It also provides a 125 degree viewing field, night vision and two-way audio. These tips will help you keep your tools from getting lifted. Sense8 Home Security offers a robust security system that does not have a monthly service charge. It provides a 1080p HD camera with night vision, motion detection and a 95-decibel alarm and speaker. It even monitors the heat and humidity and will send an alert if detects an unusual change. If you’re away from home, you can still communicate with someone at home through video. You can also try these DIY home security tricks, too. It was only a matter of time before someone brought the traditional doorbell into the 21st century. With the Ring Video Doorbell you can enhance your home security and just make your life easier in general. The Ring Doorbell connects to your home Wi-Fi network and takes HD video of the area directly outside of your door. You can then access the camera’s video feed through an app on your phone from anywhere in the world, whether you are in your backyard or in another country. The doorbell even has a two-way audio channel so you can have a full conversation with whoever is at your door. The Ring Doorbell can be set to send you a notification every time someone walks up to your house so you can check out any unwanted or surprise guests. In terms of design, the Ring Doorbell is not much bigger than other doorbells and comes in a variety of colors so that it works with any paint scheme. The Ring Video Doorbell is sold online and in stores starting at $179, with an upgraded “Pro” version available for $249. Did you know you can retrofit your garage door opener with Wi-Fi? This home automation device is full of features, making it much more than a camera. It has the noteworthy 1080p image sensor, motion and sound detection, mechanical pan and tilt, time-lapse, triggered video recording and motion-tracking that allows the camera to follow someone around the room. Talk about a smart camera! If you purchase a surveillance camera, here’s how to install it outdoors. Buy this smart alarm on Amazon. This home security camera is a video doorbell that allows you to see and speak with the person outside. The most notable features include the topnotch video quality at 1080p with color night vision, and the capability of capturing footage for several seconds prior to a triggered event. The Ring Video Doorbell is another popular option you might want to check out.